Getting your “buttons” pushed or getting “triggered” is an opportunity to heal and grow. The more hurts we’ve endured and the weaker our boundaries, the more reactive we are to people and events. Our triggers – our buttons – are our wounds. Codependents are off the charts when it comes to reacting to others’ feelings, needs, problems, opinions, wants, and more. When we react, we permit our insides to be taken over by someone or something outside of us. There’s no filter or boundary. We’re pulled off center and might start thinking about that person or about what might happen in the future. Negative reactions easily escalate hurt feelings and conflict. Often, however, we’re really reacting to someone from our past. A wise, apropos Al-Anon slogan is “Q-Tip,” – “Quit Taking It Personally.” Interpreting someone else’s words or actions to be a comment about us is taking another person’s feelings personally. We might react with guilt or defensiveness because we assume we’re the cause of someone else’s negative emotion or problem. We have just taken on the other person’s problem or shame when they shame or blame us. Our peace of mind and self-esteem now resides with someone else. What we react to – our “triggers”– are unique to our personality and individual history. 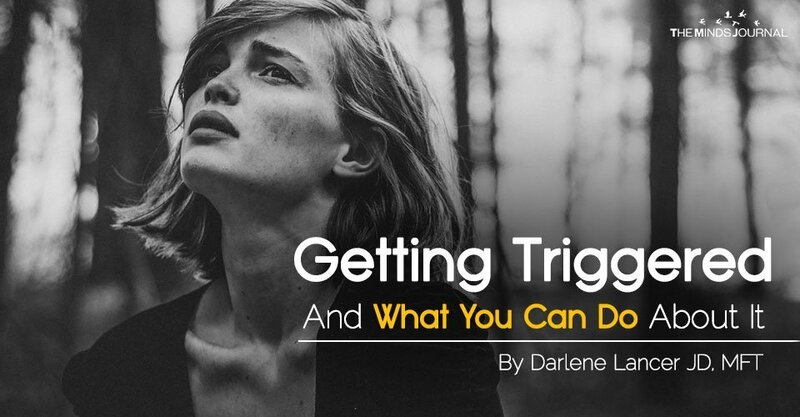 Think of triggers as wounds – often from past trauma. When we’re triggered, we’re re-experiencing a past injury in present time – similar to a post-traumatic stress reaction. It’s reopening a painful wound that hasn’t had a chance to heal. A sign of being triggered is when our reaction is disproportionate to the present event or not reasonably related to the actual present facts.